NLEX rallied in the second half to hand Meralco its second loss in a row even as Rain or Shine exploited June Mar Fajardo’s early exit to frustrate the San Miguel Beermen in the 2016 PBA Commissioner’s Cup. NLEX import Al Thornton once again put his prolific offensive skills on display as he helped lead the Road Warriors to a 104-99 win over the Meralco Bolts in the 2016 Oppo PBA Commissioner’s Cup on Friday at the SMART-Araneta Coliseum. Thornton scored 38 big points – 20 of those in the third period – to pace NLEX, which snapped a two-game losing streak to improve to 3-3. The Road Warriors handed sister team Meralco a second straight defeat after the Bolts’ terrific start to the conference. The Bolts fell to 5-2 after back-to-back losses. Garvo Lanete added 14 points, while Kevin Alas chipped in with 10 to back Thornton up. Veteran center Asi Taulava also had a solid game with eight points and nine rebounds in the win. 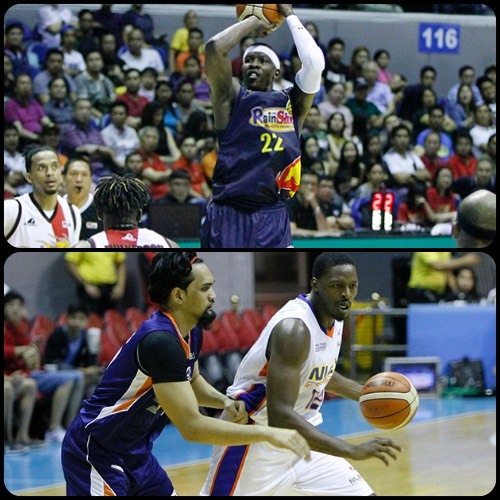 Arinze Onuaku had 16 points and 18 rebounds to lead Meralco, while Amer and Jared Dillinger each had 14 markers. The Rain or Shine Elasto Painters found themselves in a big hole early in the game but had the fortitude to come back and beat the San Miguel Beermen, 108-105, in the 2016 Oppo PBA Commissioner’s Cup on Friday at the SMART-Araneta Coliseum. Rain or Shine trailed by 18 points at the end of the first quarter but battled back to claim a crucial victory that placed them back up to .500 with three wins and three losses. They also snapped a four-game winning streak for San Miguel, who dropped down to 3-2. Mo Charlo, playing his first game in the PBA, had 35 points, 13 rebounds, and three assists in a strong debut for the Elasto Painters. He shot 12-for-22 (54-percent) from the field and an impressive 6-for-8 from beyond the arc. JR Quinahan added 15 points, while Chris Tiu and Maverick Ahanmisi each had 13 markers. Rain or Shine sharpshooter Jeff Chan chipped in with 12 points as well. San Miguel was led by its own import, Tyler Wilkerson, who had 33 points and 10 rebounds. They also got 18 points apiece from Marcio Lassiter and Alex Cabagnot. The Beermen, though, only got four points from back-to-back PBA MVP June Mar Fajardo, who exited the game in the second quarter with an injury after only 12 minutes of play.